If (c, f(c)) is the point on the curve and is a second point on the graph of f, the gradient of the secant line through the two points is given by substitution into the gradient formula. we draw the straight line y = mx + c passing along the bottom of the log, then this line is a tangent to the curve at the point of contact. The gradient m of the tangent is the gradient of the curve at the point of contact. Take the point P(3,9) and another point Q close to (3,9) on the curve. Let the x coordinate of Q be 3+h where h is small. Since y = x2 at Q，the y coordinate of Q will be (3+h)2 . If h=0.001, the gradient of PQ is 6.001, and when h=-0.001, the gradient of PQ is 5.999. The gradient of the tangent at P is between these two values. As approaches 0, Q approaches P, and secant line QP approaches tangent line. Then, the gradient of secant line QP approaches the gradient of tangent line ,Thus, the gradient of the tangent at (3,9) would be 6. 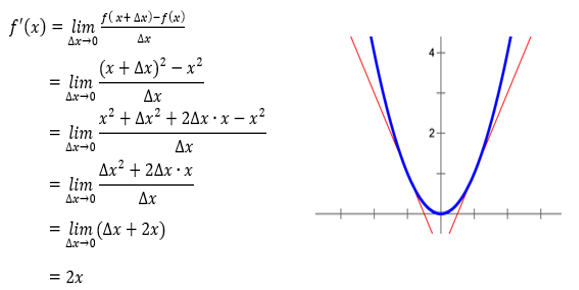 The gradient function, or f’(x) is called the derivative of y with respect to x. The process of finding the derivative of a function is called differentiation. This “new” function gives the gradient of the tangent line to the graph of f at the point (x, f(x)), provided that the graph has a tangent line at this point.